One of the leading medical technology companies in the world, Stryker Orthopaedics provides a wide range of reconstructive, medical and surgical products that are intended to improve the quality of life in patients. In some cases, however, Stryker hip replacement devices have caused serious and debilitating injuries, requiring patients to undergo hip revision surgery to repair the damage. Stryker hips, including the Rejuvenate, ABG II and Trident systems, have been some of the most problematic for the company and for patients. All three hip models were voluntarily recalled from the market by Stryker due to higher than acceptable rates of dislocation and the need for revision. Currently, there are hundreds of lawsuits pending in state and federal courts involving these hip replacement systems. Plaintiffs claim the company failed to warn them about the associated hip replacement complications and failed to conduct adequate safety studies before launching the products on the market. In a third-quarter report for 2013, the device maker revealed that it had earmarked more than $1 billion to cover Stryker hip settlements for patients injured by the Rejuvenate, ABG II and Trident implants. 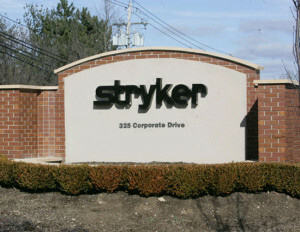 Founded by Dr. Homer Stryker in 1941, Stryker has a long history of work in the orthopedic industry, originally named “The Orthopedic Frame Company.” Now a Fortune 500 company, Stryker has over 22,000 employees worldwide, sells products in over 100 countries, and enjoys $8.7 billion in annual sales globally. In addition to hip implants, Stryker also designs, manufacturers, and sells knee replacements, foot and ankle devices, spinal implants, and craniofascial devices, while providing computer assisted surgery and endoscopic surgical solutions. Headquartered in Mahwah, New Jersey, the company is currently embroiled in consolidated litigation in the Superior Court for Bergen County, New Jersey, involving its Rejuvenate and ABG II hip replacement devices. Another mass tort has been established in New Jersey in Atlantic City Superior Court, for cases involving the Trident hip device. In June 2013, federal claims involving the Rejuvenate and ABG II hip replacements were consolidated in multidistrict litigation (MDL 13-2441) in U.S. District Court for the District of Minnesota, under the purview of Judge Donovan W. Frank. Approved in 2008 and 2009, the Stryker Rejuvenate and ABG II systems were initially marketed as being of advanced technological innovation, offering surgeons more options than ever in fitting patients of different anatomies. Unlike most designs, which included a one-piece stem, these new implants had a “modular-neck” design with two-part hip stems. The surgeon inserts the neck into the stem, and has a range of options to choose from when fitting an individual patient, depending on age, height, body-type, and mobility. These two Stryker hip replacement systems were initially designed to avoid the issue of metal contamination seen with other systems made of metal alloys, since they included ceramic cups and metal sockets. Yet both components in the two-part stem were made of metal. Post-marketing reports indicated that these stem components could rub together, shedding metallic debris into the surrounding joint area and bloodstream. Within a couple years, the FDA had received as many as 60 adverse event reports related to the systems. In April 2012, the company issued an urgent field safety notice to surgeons and hospitals, warning that the Rejuvenate and the ABG II could cause side effects related to metal contamination. A few months later, in July 2012, Stryker implemented a voluntary recall of both devices, stating that the modular stems could cause fretting and/or corrosion resulting in adverse local tissue reactions, pain and swelling. The Trident Ceramic Acetabular System was one of Stryker’s earlier problematic hip replacement products . This device featured a ceramic-on-ceramic design, which was supposed to produce less wear than metal and plastic materials. Targeted to resist chipping and fracturing due to a new titanium sleeve, it was marketed as an implant that would relieve pain, restore function, and correct deformities in those with arthritis and other joint destructive conditions. The FDA approved the Stryker Trident for implantation in patients in 2003, but as early as 2005, the agency started receiving reports of problems linked to the device. In March 2007, the FDA sent the first of two warning letters to the company stating their concerns over the Cork, Ireland manufacturing facility. The company was violating Current Good Manufacturing Requirements there, according to the FDA, and was improperly manufacturing, packaging, and storing the Trident Acetabular system. Meanwhile, the complaints involving the Trident continued to roll in, with injured patients seeking damages for Stryker hip replacement problems in court. On January 28, 2008, the company implemented a voluntary recall of the Trident Hemispherical Cups and the Trident Acetabular PSL cup, withdrawing these products from the market. As of November 2013, nearly 500 Rejuvenate and ABG II cases were consolidated in New Jersey. Judge Brian R. Martinotti has ordered mediation talks to commence in the hopes of resolving the cases in out-of-cort settlements before the first trials begin. Hundreds more Stryker hip lawsuits continue to proceed on a federal level in the Minnesota MDL. Plaintiffs typically cite Stryker hip complications like metal poisoning, premature loosening, pseudotumors and implant failure requiring revision surgery. They bring counts of negligence, failure to warn, and defective design. Illinois resident Randal Crew, for example, filed a Stryker hip lawsuit in February 2013, claiming that after he was implanted with the Rejuvenate system, he developed pain in the groin and hip area, and developed a hard mass in his right buttock. Less than two years after he received the implant, he needed revision surgery to have it removed and replaced. Because of the damage the Stryker hip allegedly caused, Crew had to endure several additional surgeries to remove damaged tissue and bone. He is now confined to a wheelchair with limited range of motion in his hips and suffers from chronic pain. He seeks damages in excess of $15 million. Patients who received Stryker hip systems and then experienced problems like pain, squeaky joints, metal contamination and other injuries may be eligible for a Stryker hip replacement lawsuit. Medical costs associated with revision surgery and other complications can be ongoing and overwhelming. A Stryker hip lawyer may be able to help recover compensation for victims who received these defective medical devices.